Pyrophyllite–TiO2 nanocomposite PTi750 was successfully synthesized using a sol–gel method at ambient temperature based on exfoliation of the pyrophyllite layered clay by incorporation of the TiO2 precursor titanium(IV) t-butoxide. PTi750 exhibited higher photocatalytic activity in phenol degradation compared with commercial TiO2 Aeroxide P25. Ag-photodeposited PTi750 was more photoactive than PTi750, exhibiting detoxification, total degradation, and good mineralization of polluted solution and excellent stability after five reuses at optimal conditions in terms of the parameters pH, H2O2 concentration, and photocatalyst amount. The nanocomposites were investigated using several techniques, viz. diffuse-reflectance ultraviolet–visible (UV–Vis) spectrophotometry, scanning electron microscopy, transmission electron microscopy, X-ray photoelectron spectroscopy, X-ray diffraction analysis, X-ray fluorescence spectroscopy, Fourier-transform infrared spectroscopy, and Brunauer–Emmett–Teller (BET) specific surface area measurements. El Gaidoumi, A.; Doña-Rodríguez, J.M. ; Pulido Melián, E.; González-Díaz, O.M. ; Navío, J.A. ; El Bali, B.; Kherbeche, A. The copper-impregnated pyrophyllite (Cu/RC) was prepared and used as catalyst in catalytic wet peroxide oxidation (CWPO) of phenol. The catalyst was prepared by impregnation of copper (2.5 wt%) into pyrophyllite-type clay and characterized by X-ray diffraction, X-ray fluorescence, X-ray photoelectron spectroscopy, Fourier transform infrared spectroscopy, and transmission electron microscopy. 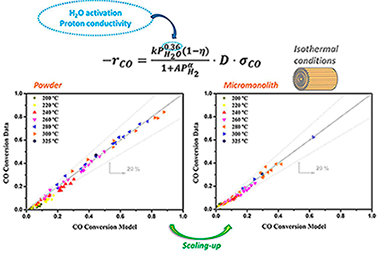 The optimum operation conditions for CWPO of phenol over Cu/RC were determined by investigating the effects of pH, temperature, catalyst amount, and hydrogen peroxide concentration. Stability of the Cu/RC catalyst and toxicity of treated solution were studied, by measuring the copper concentration leached out from the catalyst and the inhibition of Vibrio fischeri bacteria bioluminescence, respectively. The probable degradation mechanism of phenol over Cu/RC was considered by HPLC analysis. The obtained results showed that Cu/RC achieved highest activity (total phenol degradation and 80% TOC reduction) and detoxification with remarkable low copper leaching concentration (0.006 mg\,L−1)mg\,L−1) at optimized conditions (pH == 3, T=50∘T=50∘C, 2 g\,L−1g\,L−1 catalyst amount, 50 mg L−1L−1phenol concentration and 7.45 mmol\,L−1mmol\,L−1 hydrogen peroxide concentration during 4 h). Meanwhile, few intermediates with low concentration were observed by the HPLC analysis for the CWPO of phenol. The Cu/RC catalyst showed a good activity after five successive runs (88% of degradation and 73% mineralization) at optimized conditions. Bright luminescence in rare-earth (RE) nanocrystals, the so-called nanophosphors, is generally achieved by choosing a host that enables an effective excitation of the RE activator through charge or energy transfer. Although tungstate, molybdate, or vanadate compounds provide the aforementioned transfer, a comparative analysis of the efficiency of such emitters remains elusive. Herein, we perform a combined structural and optical analysis, which reveals that the tetragonal GdVO4 matrix gives rise to the highest efficiency among the different transparent nanophosphor films compared. Then, we demonstrate that by a sequential stacking of optical quality layers made of Eu3+- and Dy3+-doped nanocrystals, it is possible to attain highly transparent white-light-emitting coatings of tunable shade with photoluminescence quantum yields above 35%. Layering provides a precise dynamic tuning of the chromaticity based on the photoexcitation wavelength dependence of the emission of the nanophosphor ensemble without altering the chemical composition of the emitters or degrading their efficiency. 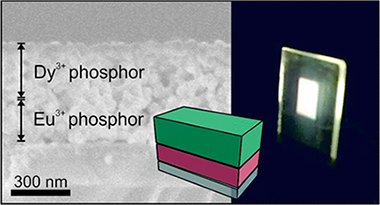 The total extinction of the incoming radiation along with the high quantum yields achieved makes these thin-layered phosphors one of the most efficient transparent white converter coatings ever developed. CrAlYN hard coatings with two different average Al contents: similar to 16 at.% and similar to 25 at.%, and Y concentration varying between 1.2 and 5.7 at.% were deposited by direct current reactive magnetron co-sputtering of mixed Cr-Al and Y targets on commercial M2 steel substrates. The samples were heated to 1000 degrees C in air during 2 h to study their oxidation resistance and thermal stability. The Y content is critical and the coatings present different behaviour depending on the Al content. The best oxidation resistance and thermal stability are obtained for the coating with similar to 16 at.% Al and 3.4 at.% Y. The initial film microstructure and the cubic phase (fcc-CrAlN) were retained, and a thin (Cr,Al)(2)O-3 oxide protective scale was formed. At lower Y content (1.2 at.%) iron, from the substrate crosses the coating, while a higher content (4.6 at.%) avoided the iron diffusion at the expense of a thicker oxide scale with new oxide phases. The coatings with higher Al content (similar to 25 at. %) were not thermally stable at 1000 degrees C. A good oxidation resistance was obtained for 2.6 at.% of Y although new phases (hcp-AlN and Cr-Fe) were formed. 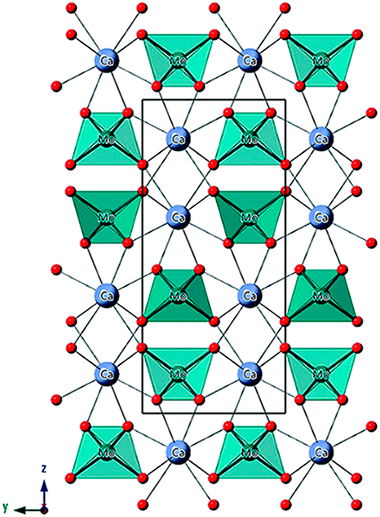 Higher amount of yttrium (similar to 5.7 at. %) led to the complete oxidation of the coating. Dielectric barrier discharge (DBD) plasmas and plasma catalysis are becoming an alternative procedure to activate various gas phase reactions. A low-temperature and normal operating pressure are the main advantages of these processes, but a limited energy efficiency and little selectivity control hinder their practical implementation. In this work, we propose the use of isotope labelling to retrieve information about the intermediate reactions that may intervene during the DBD processes contributing to a decrease in their energy efficiency. The results are shown for the wet reforming reaction of methane, using D2O instead of H2O as reactant, and for the ammonia synthesis, using NH3/D-2/N-2 mixtures. In the two cases, it was found that a significant amount of outlet gas molecules, either reactants or products, have deuterium in their structure (e.g., HD for hydrogen, CDxHy for methane, or NDxHy for ammonia). From the analysis of the evolution of the labelled molecules as a function of power, useful information has been obtained about the exchange events of H by D atoms (or vice versa) between the plasma intermediate species. An evaluation of the number of these events revealed a significant progression with the plasma power, a tendency that is recognized to be detrimental for the energy efficiency of reactant to product transformation. The labelling technique is proposed as a useful approach for the analysis of plasma reaction mechanisms. 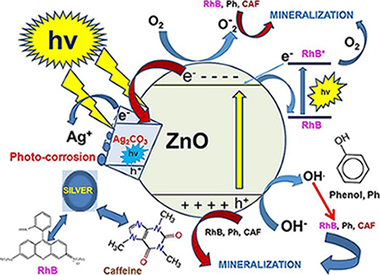 With the aim of improving the photocatalytic properties of a previously optimized zinc oxide photocatalyst, the effect of the incorporation of different amounts of Ag2CO3 on the aforementioned ZnO has been studied. For this purpose we report the synthesis, by means of simple precipitation procedures, of bare ZnO and Ag2CO3 samples as well as the coupled materials ZnO/Ag2CO3 (X) (where X = 1%, 2%, 4% and 5% in molar percentages). Both, single and coupled materials have been characterized by different techniques (XRD, XRF, N2-absorption, SEM, TEM, UV–vis/DRS and XPS). To assess the advantages or disadvantages that Ag2CO3 addition could have over the optimized ZnO, the photocatalytic properties have been established by following the photo-degradation of selected toxic molecules, both in the UV and in the visible, as well as using complementary techniques of liquid medium analyses (TOC and Atomic Emission Spectrometry with plasma ICP). Three selected substrates were chosen: Rhodamine B (RhB) as a dye, and phenol and caffeine as colourless recalcitrant toxic molecules. Our results suggest that although the use of Ag2CO3 could be beneficial to implement the optical absorption towards the visible region, however, other effects have to be bore in mind, such as the photo-corrosion of Ag2CO3 and the chemical structure of the chosen substrate, to elucidate whether the addition of Ag2CO3 has beneficial or detrimental effects on the photocatalytic properties of the coupled ZnO/Ag2CO3 materials. ZnO-ZrO2 nanocomposites using zinc (II) acetylacetonate and different ZnO contents (13, 25, 50, and 75% mol) were synthesized through sol-gel method. The synthesis process was strongly related to nanocomposite properties especially on their structural composition. The obtained ZnO-ZrO2 nanomaterials presented tetragonal crystalline structure for zirconia whereas hexagonal one was formed in ZnO. Raman spectroscopy and XRD patterns confirmed the formation of tetragonal zirconia whereas inhibition of monoclinic structure was observed. Addition of ZnO affected the pore size distribution of the composite, and the measured specific surface areas were from 10 m2/g (for pure ZnO) to 46 m2/g (pristine ZrO2). Eg values of ZrO2 were modified by ZnO addition, since calculated values using Kubelka-Munk’s function varied from 4.73 to 3.76 eV. The morphology and size of the nanomaterials investigated by electron microscopy showed formation of nanorods for ZnO with sizes ranging from 50 nm to 300 nm while zirconia was formed by smaller particles (less than 50 nm). The main advantage of using the nanocomposite for photocatalytic degradation of phenol was the mineralization degree, since 75ZnO-ZrO2 nanocomposite surpassed mineralization reached by pure ZnO and also inhibited formation of undesirable intermediates. This work describes the electric study of Lithium lanthanum titanate (La0.59Li0.24TiO3) ceramics performed by Complex Impedance Spectroscopy. The nanoparticle powders have been synthesized through high energy ball milling and sintered via Spark Plasma Sintering technique. The experimental impedance data have been analyzed using the equivalent circuit model, the Extended Jonscher universal law and the derivative method. From these models, we have determined the dielectric response as well as the grain and grain boundary conductivity. The samples show ionic conductivity values between 10(-5) to 10(-4) S cm(-1) in the studied temperature range, and activation energy values 0.24 eV and 0.48 eV for grain and grain boundary, respectively. These results confirm the Li+ ions mobility through the crystalline structure of the material. Bi3+ codoping has been proposed in this work with a twofold objective, namely, enhancing the luminescence emission of Eu3+:LaF3 nanoparticles (NPs) and increasing their X-ray attenuation capacity, with the purpose of obtaining a bimodal bioprobe for luminescence bioimaging and X-ray computed tomography. 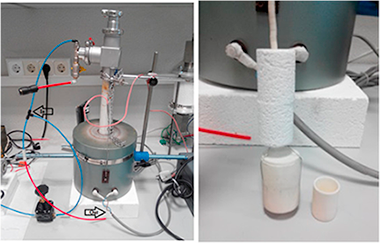 The synthesis method, reported here for the first time for LaF3 particles, allowed obtaining uniform, nonaggregated NPs using a homogeneous precipitation in polyol medium at room temperature in just 2 h. The simplicity of the synthesis method allows the large-scale production of NPs. LaF3 NPs with different Eu3+ contents were first synthesized to find the critical Eu3+ concentration, producing the highest emission intensity. This concentration was subsequently used to fabricate Bi3+-Eu3+-codoped LaF3 NPs using the same method. The emission intensity of the codoped NPs increased in more than one order of magnitude, thanks to the possibility of excitation through the Bi3+. Eu3+ energy-transfer band. The luminescence properties of the codoped NPs were analyzed in detail to find the mechanism responsible for the emission enhancement. 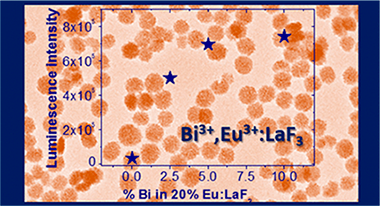 Finally, it was demonstrated that the high atomic number of Bi3+, higher than that of lanthanides, was an added value of the material because it increased its X-ray attenuation capacity. In summary, the LaF3 NPs codoped with Eu3+ and Bi3+ presented in this work are promising candidates as a bimodal bioprobe for luminescence bioimaging and X-ray computed tomography. Rare-earth-based phosphors are the materials on which current solid-state lighting technology is built. However, their large crystal size impedes the tuning, optimization, or manipulation of emitted light that can be achieved by their integration in nanophotonic architectures. 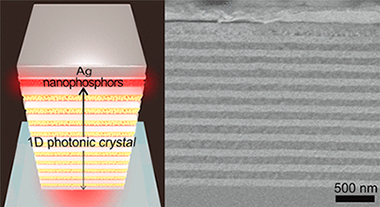 Herein we demonstrate a hybrid plasmonic-photonic architecture capable of both channeling in a specific direction and enhancing by eight times the emission radiated by a macroscopically wide layer of nanophosphors. In order to do so, a slab of rare-earth-based nanocrystals is inserted between a dielectric multilayer and a metal film, following a rational design that optimizes the coupling of nanophosphor emission to collective modes sustained by the metal-dielectric system. Our approach is advantageous for the optimization of solid-state lighting systems. The viability of water gas shift catalytic system for mobile application passes through obligatory reactor volume reduction, achieved normally by using less charge of more efficient catalyst. Completely new concept for catalyst design is proposed: a catalytic system including classically reported WGS catalysts of different nature or active phase (Cu, Pt or Au) mechanically mixed with an ionic conductor. The influence of the later on catalyst activity is studied and discussed, more precisely its effect on the rate of the reaction-limiting step and catalysts' efficiency. It is demonstrated with this study, that the presence of an ionic conductor in contact with a WGS catalyst is essential for the water supply (dissociation and transport), thereby potentiating the water activation step, whatever the mechanism and catalyst overall performance. Water presence and concentration strongly influence CO conversion and CS+ selectivity in the Fischer Tropsch reaction. In this work, the influence of the water concentration was investigated using a model Ru/Al2O3 (5 wt. %) catalyst. The surface species formed after CO and H-2 adsorption in dry and wet (different water concentrations) conditions were analyzed by FTIR. Firstly, water adsorption was carried out up to complete filling of the pores and then CO was put in contact with the catalyst. The absence of adsorbed CO species in these conditions evidences that CO diffusion in water controls the access of the gas to the active sites and explains the negative effect of high water concentrations reported by some authors. 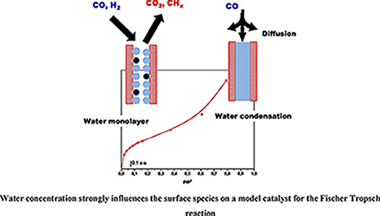 Moreover, the adsorption of a mixture of CO + H-2 + H2O, being the water concentration close to that needed to have a monolayer, and a dry mixture of CO + H-2 were carried out and compared. Results evidence that water in this low concentration, is able to gasify the surface carbon species formed by CO dissociation on the metallic sites. This cleaning effect is related to the positive effect of water on CO conversion detected by some authors. 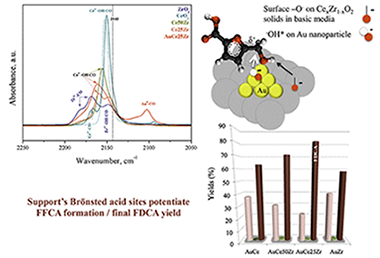 A series of CexZr1-xO2 supports with different Ce/Zr molar ratios were utilized for the preparation of gold catalyst used in the selective oxidation of 5-hydroxymethyl-2-furfural to 2,5-furandicarboxylic acid. The used method of gold deposition allows the preparation of gold particles with homogeneous size and shape distribution, a formulation very useful for studies dedicated to revealing the support participation in the reaction. The supports are characterized by Fourier transform infrared spectroscopy using CO as probe molecule, and the sample catalytic activity is thereafter correlated to the support acid site distribution. The possible participation of its Lewis/Bronsted acidity in the reaction mechanism is also proposed. 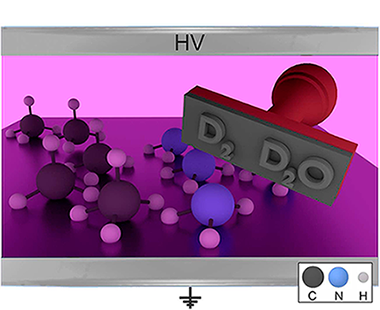 Eu3+-Doped calcium molybdate is an excellent phosphor for lighting and display devices due to the very intense pure red emission after UV excitation. It has been reported in the literature that the CaMoO4 unit cell volume expands after Eu3+ doping, in spite of the smaller Eu3+ ionic radius compared with Ca2+. Likewise, several studies found that the emission intensity of the phosphor could be improved by codoping with alkaline ions like Li+, Na+ or K+. None of these studies correlated the apparent volume expansion and luminescence enhancement with the crystal structural details. This paper analyses the aliovalent substitution mechanism and crystal structure of Eu3+:CaMoO4 and Eu3+,Na+:CaMoO4 phosphors using complementary techniques like Raman spectroscopy, EXAFS and SPD. We found that the substitution mechanism was different for both systems, with Ca site vacancies forming in the Eu3+:CaMoO4 phosphors and leading to Ca1-3xEu2xxMoO4 compositions, while the Eu3+,Na+:CaMoO4 phosphors formed Ca1-2xEuxNaxMoO4. SPD showed that the cell volume expansion observed with increasing Eu3+ content is related to the increase of the Mo-O bond distance due to the higher electronegativity of Eu3+ compared with Ca2+. Finally, it was shown that the luminescence properties, i.e. lifetime values and quantum yields (the latter reported here for the first time), do not depend on the presence of monovalent ions in the crystal structure but, exclusively, on the Eu3+ content of the phosphor. 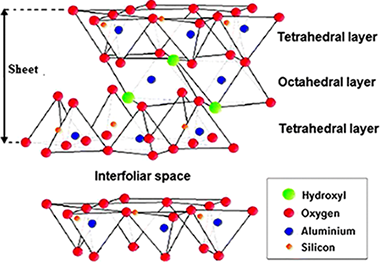 The integral and detailed analysis of the materials presented in this paper, ranging from crystal structure to luminescent properties including elemental composition, allows a full picture of the structure-property relationships that had never been addressed before for CaMoO4-based phopshors. In this work, the multicycle activity of natural CaO precursors (limestone and dolomite) and Ca-based composites (Ca3Al2O6/CaCO3 and ZrO2/CaCO3 mixtures) has been studied for Thermochemical Energy Storage (TCES) in Concentrated Solar Power (CSP) plants by means of the Calcium-Looping process (CaL), using two integration schemes proposed elsewhere that differ in the calcination stages. Under CSP-He conditions, calcination for CaO regeneration is performed under pure He at low temperatures (725 degrees C) while under CPS-CO2 conditions calcination is carried out under pure CO2 at high temperatures (950 degrees C). The latter avoids the use of selective membranes to separate He from CO2 even though it requires the use of more expensive materials for solar receptors. Carbonation/calcination conditions drastically affect the multicycle CO2 uptake of the materials tested. Effective multicycle conversion is higher in CSP-He tests due to the mild conditions employed for calcination, which mitigates CaO sintering. On the other hand, the harsh calcination conditions used in CSP-CO2 tests enhance sintering of CaO derived from limestone and the Ca3Al2O6/CaCO3 composite due to the low Tammann temperature of Ca3Al2O6. CaO sintering is hindered by the presence of inert oxides with high Tammann temperatures, such as ZrO2 in the ZrO2/CaCO3 composite and MgO in dolomite. 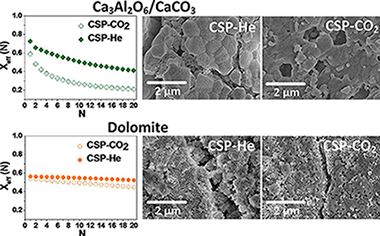 Dolomite derived CaO shows high effective conversion values along the carbonation/calcination cycles when tested under both types of conditions, as compared to limestone and the composites, which suggests that the integration scheme based on CSP-CO2 conditions would be a feasible alternative to CSP-He if natural dolomite were used as CaO precursor. The eutectic mixture Li2CO3-Na2CO3-K2CO3 is investigated as a high temperature heat transfer fluid and storage medium alternative for molten salt solar thermal power plants. This salt has an operating temperature range of 400–700 °C, enabling the use of higher temperature/efficiency power cycles. However, this carbonate mixture is known to thermally decompose in air. This study evaluates the thermal stability of the salt mixture under different cover gases: air, nitrogen, carbon dioxide, and an 80/20 carbon dioxide/air mixture. Initial characterization is performed through thermogravimetric analysis (TGA), followed by larger scale testing in a custom-made reactor to simulate conditions closer to its practical use. The results show improved thermal stability with a CO2 atmosphere. The decomposition kinetics under different cover gases are estimated from TGA data. However, larger-scale, longer duration experiments show much slower decomposition rates compared to the classical TGA approach. These findings indicate that the main contribution to mass loss in TGA is due to vaporization rather than thermal decomposition. Thus, a proper evaluation of the molten salt´s thermal stability can only be obtained from reactor experiments where vaporization is inhibited. Very long induction periods (of the order of days) are observed, suggesting that the kinetic decomposition mechanism is a nucleation and growth type. Other considerations for future plants incorporating these high temperature salts are discussed. The peculiar defect chemistry of hybrid organic–inorganic lead halide perovskites is believed to be partially responsible for the outstanding performance of this solution-processed material in optoelectronic devices. While most effort has been put on the management of halide defects (the ones presenting the highest mobility) for CH3NH3PbI3, its bromide counterpart has not been so widely studied. Although the former is the material of choice for photovoltaics, the latter is present in most light-emitting applications. 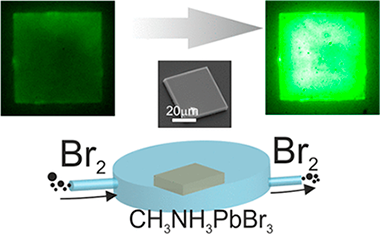 Here, we report how the exposure of CH3NH3PbBr3 single crystals to a bromine atmosphere strongly affects its emission properties. Such improvement takes place in the absence of apparent signs of degradation and remains for tens of hours. We propose an explanation based on the defect structure for this material where bromine-related defects can act as deep or shallow traps. These results are of relevance for a material expected to be present in a new generation of solution-processed light-emitting devices. A kinetic study of the water gas shift (WGS) reaction has been carried out on a Pt-based catalyst promoted by a Zr-based proton conductor. The investigation was first performed on powders with diluted feed mixtures and then extended to more severe and representative conditions by using a catalyst coated metallic micromonolith. Temperature measurements reveal that isothermal conditions were obtained along the micromonolith during the tested conditions. In addition, the very thin catalytic layer allows for the discarding of intraporous resistances, providing excellent conditions to analyse the kinetics of the WGS reaction under the integral regime. The proposed rate expression accounts for independence on CO concentration, an inhibiting effect of H-2 and a promoting effect of H2O; kinetic orders on CO and H-2 are in line with those reported in the literature for the Pt-based catalyst. Instead, the obtained reaction order of water (0.36) is significantly lower than that reported for unpromoted catalysts (typically 0.77-1.10) in good agreement with the proposed water-enhancer effect of the proton conductor on the rate-limiting step. Metallic micromonoliths turn out to be a powerful tool for the kinetic investigation, due to the absence of mass and heat transport limitations and represent a strategy for the intensification of the WGS unit for future applications of fuel processors in small mobile devices. The current scenario where the effects of global warming are more and more evident, has motivated different initiatives for facing this, such as the creation of global policies with a clear environmental guideline. Within these policies, the control of Greenhouse Gase (GHG) emissions has been defined as mandatory, but for carrying out this, a smart strategy is proposed. This is the application of a circular economy model, which seeks to minimize the generation of waste and maximize the efficient use of resources. From this point of view, CO2 recycling is an alternative to reduce emissions to the atmosphere, and we need to look for new business models which valorization this compound which now must be considered as a renewable carbon source. This has renewed the interest in known processes for the chemical transformation of CO2 but that have not been applied at industrial level because they do not offer evident profitability. For example, the methane produced in the Sabatier reaction has a great potential for application, but this depends on the existence of a sustainable supply of hydrogen and a greater efficiency during the process that allows maximizing energy efficiency and thermal control to maximize the methane yield. Regarding energy efficiency and thermal control of the process, the use of structured reactors is an appropriate strategy. The evolution of new technologies, such as 3D printing, and the consolidation of knowledge in the structing of catalysts has enabled the use of these reactors to develop a wide range of possibilities in the field. In this sense, the present review presents a brief description of the main policies that have motivated the transition to a circular economy model and within this, to CO2 recycling. This allows understanding, why efforts are being focused on the development of different reactions for CO2 valorization. Special attention to the case of the Sabatier reaction and in the application of structured reactors for such process is paid. In this work, we studied the mechanical performance of an LDPE film (0.22 mm in thickness) used as a material in the design of greenhouse covers. We investigated the effects of ageing at different periods of its service life and applying chemical substance treatments used as pesticides on greenhouse crops and after breakage using mechanical traction. Numerical simulations were performed using the finite element method. For this purpose, one section of the complete geometry of the greenhouse cover and different load conditions (1-5 kPa) were considered for the modelling. The performance of the polymer was assumed to be linearly elastic to simplify the governing equations. The study demonstrated that the LDPE film used was no longer effective as a greenhouse cover film due to the degradation of its mechanical properties. It was shown that the general performance of this film was in the plastic zone and its performance was non-linear. The results deduced from the present study are of interest because they show the material failure process of greenhouse covers in relation to the degradation process.